1/2" Half-moon, nail-in PEX Hanger for securing PEX piping. Also available in 1" size. PEX Crimp Ring for PEX Pipe, 1/2" 1" Half-moon, nail-in PEX Hanger for securing PEX piping. Also available in 1/2" size. PEX Stainless Steel Clamp Crimp Ring, 1/2"
PEX Stainless Steel Clamp Crimp Ring 1"
PEX Central Boiler Clamp, Stainless Steel, 1"
For use with Central PEX pipe. Install with Cinch Tool (p/n 5925) or Ratchet Cinch Tool (p/n 4472). PEX Stainless Steel Clamp Crimp Ring 1" PEX Adapter, 1/2" PEX x 1/2" Sweat Fittings. For adapting copper pipe to Central PEX pipe. 1" stainless steel hose clamp. PEX Central Boiler Clamp, Stainless Steel, 1"
PEX Central Boiler Clamp, Stainless Steel, 1-1/4"
For coupling two Central PEX pipe ends. For adapting copper pipe to Central PEX tube. 1-1/4" stainless steel hose clamp. PEX Central Boiler Clamp, Stainless Steel, 1-1/4"
PEX 90° Elbow, Brass, 1/2"
For coupling two Central PEX pipe ends together. PEX 90° Elbow, Brass, 1/2" For use with 25mm PEX Pipe, 1" Stainless Steel PEX Clamps are excellent alternatives to the 5978 1" Stainless Steel Hose Clamps. 1" Stainless Steel PEX Clamp For coupling two Central PEX pipe ends. PEX Coupling, Brass, 1"
PEX Adapter, 1/2" PEX x 1/2" MIP Fittings. For adapting threaded pipe to Central PEX pipe. PEX Adapter, 1/2" PEX x 1/2" FIP Fittings. For adapting copper pipe to Central PEX pipe. For coupling two 25mm Central PEX pipe ends. 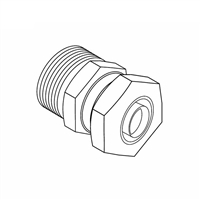 PEX 90° Elbow, Brass, 1"
PEX Adapter, 25mm x 3/4" NPT Fittings. For adapting 1" PEX to 25mm PEX pipe. For coupling two Central PEX pipe ends together. PEX 90° Elbow, Brass, 1" Brass Tee for joining Central PEX pipe ends. PEX Tee, Brass, 1"